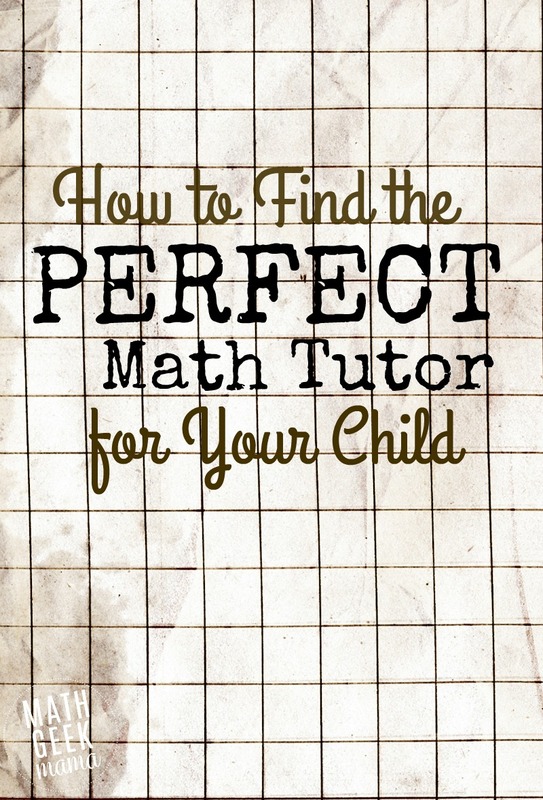 Although we as parents are to be our child’s first and most important teacher, there may come a point in their learning where you feel like a personal, one-on-one math tutor is needed. This may be because your personalities clash, they respond better to someone other than mom and dad, or because you feel like the math they’re learning is beyond your knowledge and ability. Whatever the reason, before you spend your hard earned money on a tutor, do your research to make sure you find the right option for your child. To help you, here are some ideas for how to find a math tutor. Before I share some places to find the right tutor, I want to help you think through some important considerations. Does your child need to work with someone in person or could they work online? Are there free options to try before paying someone? Be sure to do your research here, as there may be places to go that are free. For example, your child’s teacher likely has days they are available for extra help. Find out when it is and make sure your child is there that day. You can also ask your local libraries, community centers or churches if they have any tutoring programs. Often there are weekly programs happening if you can find out where they are. Another option might be at local universities or a community college, especially if your child is in high school. Ask around and see if there are any programs available. When I was in college, a group of future teacher friends and I organized a weekly tutor time on Saturdays for local high school students to help them prepare for standardized tests and SATs. If you’ve looked for free programs and can’t find anything, or it doesn’t seem to be enough help for your child, here are some other options for math tutoring. While there are lots of websites that offer lessons or videos to teach math concepts, often what kids really need is a person who can meet them where they are and help answer their specific questions, so here are some ideas to help you find what you need. It may turn out that they’re not a good fit for your child, but at least you can figure that out before you spend time and money meeting with them. Even if local libraries, community centers or churches do not offer after school tutoring programs, they likely have community boards where tutors may post information. Check around and see if you can get a few names of people to call. Even if your child’s teacher can’t offer additional one-on-one time, they probably know someone who can. Many tutors work closely with schools and teachers and may even meet at the school, so if they’re around, teachers know who they are. In addition, if there are other students in the class who already have a tutor, the teacher probably knows and can get you in touch with them. If you homeschool, you can still go to the local schools and ask the office secretaries or guidance counselors for recommendations. Often there will be a list floating around of phone numbers, or they know of students who have had success with certain math tutors, so they may be able to offer some good suggestions as well. If you’re still having trouble finding a private tutor, you may want to use the site Wyzant.com. This site is unique in that it simply works to connect students with local tutors (similar to Care.com). Your child would still meet with a tutor in person, you would simply find a tutor, pay, and set up meeting times through Wyzant. This is a great option, but may be difficult if you live in a small town or remote area because you may not be able to find a tutor close enough to you. If you’d like to try Wyzant, you can get $20 in free tutoring with the code TAKE20, or click here to redeem your coupon for $20 in free tutoring! Another option is to search on Noodle.com. This is similar in that it helps you find local tutors, but is only a search tool. You do not contact tutors or pay through the site. This is helpful though, because it searches any and all math tutors, even if they are not working through Wyzant.com. I hope you’ve found this list of ideas helpful as you seek to find the right person or option for your child. What are your tips for how to find a math tutor? If you have any other recommendations for finding math tutors or online sites, share in the comments! And if you’d like to feel more confident helping your child with math, here are some tips and encouragement! My friend is looking for a math tutor for her son; I’ll have to pass these along! Thanks for sharing at the Thoughtful Spot! You make a great point to consider how often your child will need to meet with a tutor for help with math. Math can be very sequential in the principles that are being taught. If one principle isn’t fully understood, it can make it difficult to progress with the rest of the curriculum. Knowing how often new principles are being taught can influence how often a tutor might be needed. I’ll keep this in mind when I start my family and my kids start going to school. I love your idea of checking library or community bulletin boards! I haven’t thought to try that out, yet, in the search for a good tutor for our son. He has a problem with math and multiplications, so we desperately need to find a good tutor for him. If he doesn’t learn this important information now, he might not be able to understand harder material even years down the road. We’ll have to check more community locations and ask around for what tutors are currently available. Yes, better to get some help early! I’m glad this list of tips gave you some good places to look and that you’re successful in finding the right tutor!